We’re a personal company—we want the relationships we make with our customers to be like making a new friend. 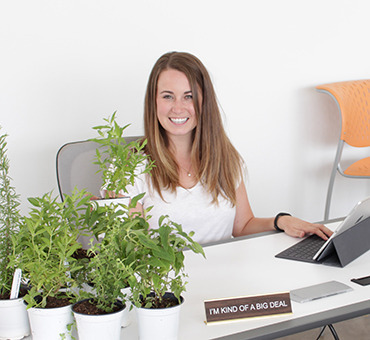 With that, we’d like you to get acquainted with our friend and Customer Experience Manager, Hollie Butterfield. She’s head of all things customer-related, so you’ll probably interact with her at some point on her growing journey. She’s here to introduce herself and offer her perspective on Gardenuity and customer service. The root of my passion has always been people. So when I was presented with the opportunity to be the heart of Customer Experience at Gardenuity, it felt like fate. Initially I found Gardenuity while reading a Family Circle magazine. Their product caught my eye, and when I saw they were located in Dallas, I knew immediately that I had to reach out. Within 45 minutes of sending an email, I received an email from Donna the Co-Founder. That’s the kind of response rate any anxious, excited, or regular ole person would want! Instantly, I could see how passionate and attentive they were to the people surrounding their business, including customers, employees, and anyone simply interested. As a consumer, one of the most impactful impressions a company can leave is their customer experience. I am very loyal to specific retailers that have made my experience shopping with them nothing short of extraordinary. My goal is to give each of our customers a memorable and wonderful experience from beginning to end.Our philosophy here at Gardenuity is to nurture every customer. We know it might be a new risk you never imagined yourself taking—we’ve been there! And we’re proud of you. That’s why we encourage every customer with humor, fun, and treat them exactly how we want to be treated. While you’re busy nurturing and tending to the garden you’re growing, we want to be right there with you through every step of the process. September 12, 2017 by Corinne L.